Jackson County Courthouse #5 | Historic Jacksonville, Inc.
One of our trivia fans asked about the Jackson County Jail pictured in “The Last Hanging in Jacksonville.” The jail shown, constructed in 1875, was the second jail on Courthouse Square. 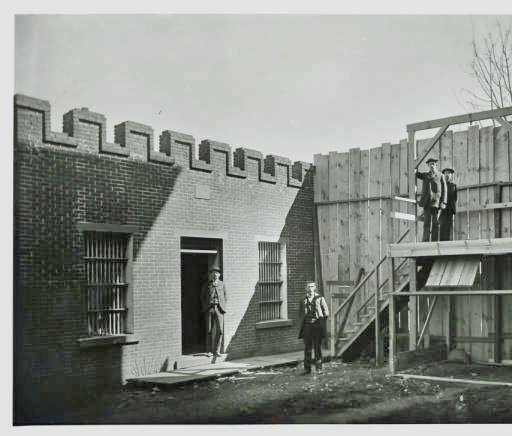 It was described as a sturdy brick building reinforced with “4,000 pounds of iron spikes for strength.” Seven inch thick wooden planks lined the masonry walls and separated the cells. The building burned to the ground in 1889 on a night when the sheriff had chosen to “sleep” at the U.S. Hotel instead of the jail. The fire took the lives of the jail’s three inmates, one of whom was scheduled for release the following day.